Don’t say I didn’t warn you! I am seriously on a pumpkin spree. 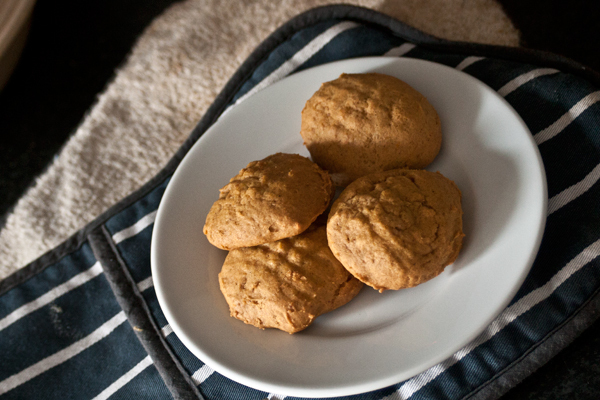 This week I made pumpkin cookies, which came out really puffy and soft, like fresh gingerbread. I think they’d be perfect drizzled with chocolate or, even better, in a pumpkin whoopie pie with a maple and pecan filling. Hmmmm, I may actually have to make those soon! These cookies were delicious, and addictive. I think I ate about five of them! Big thanks to Diamonds for Dessert for the recipe! 1. Preheat oven to 350° F (approx 1750°C). Line a few cookie sheets with baking paper and set aside. 2. In a large bowl, sift together the flour, baking powder, baking soda, salt, cinnamon, and nutmeg. 3. In the bowl of your mixer, cream together the butter and sugar until light and fluffy, then beat in the eggs and vanilla. Once everything is incorporated, add in the pumpkin. 4. Stir in the sifted dry ingredients and mix until the dough forms. Spoon out even portions of the dough in about 2-Tablespoon sized portions (or you can use my favorite gadget, the cookie dough baller!). Take a fork and dip it in a bowl of water and gently press the top of the ball down to form a criss-cross pattern and to form the dough into a slight oval. 5. Bake for 10-15 minutes until firm. They will get nice and puffy. Let them cool on the cookie sheet for about 2 minutes before moving to a cooling rack. I really liked these cookies but might try half-dipping them in chocolate next time.